“Zeta told me, Bad Chel.” Lexx replied dryly, tacking on. “Interesting combination.” It was almost like he was trying to be funny, although his expression was even and humorless. 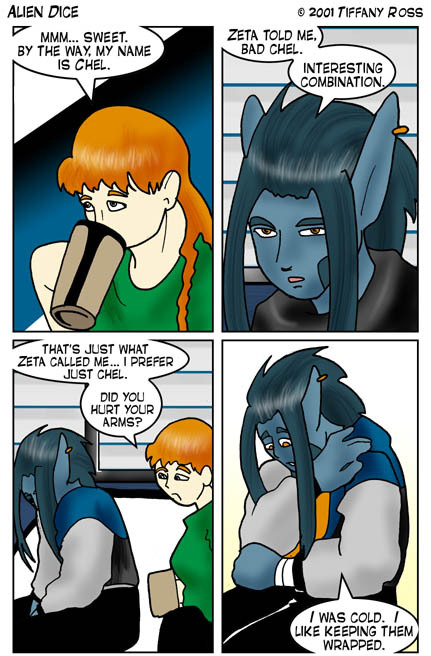 “That’s just what Zeta called me… I prefer just Chel.” The girl attempted to be friendly, despite the continual cold shoulder she was getting from Lexx. She then noticed his arms were bandaged. His shirt did little to hide that as the sleeves were short and didn’t quite make it all the way to his hands. “Did you hurt your arms?” It was a little odd for him to have wrapped his arms when the scars were healed, so she supposed he’d hurt himself when he was catching the last dice.